VR Production will be the first cutting-edge technology used to tell the story of our rich past at Origins Centre. Origins Centre Director Steven Sack. “This is a game changer for us as VR technology is interactive and engaging,” said Sack. It is the first time this kind of technology will be used at the museum. “We have never done a production like VR before, but it was necessary for us to explore the digital,” he added. the project. Funding also came from the National Institute of Humanities and Social Sciences (NIHSS). 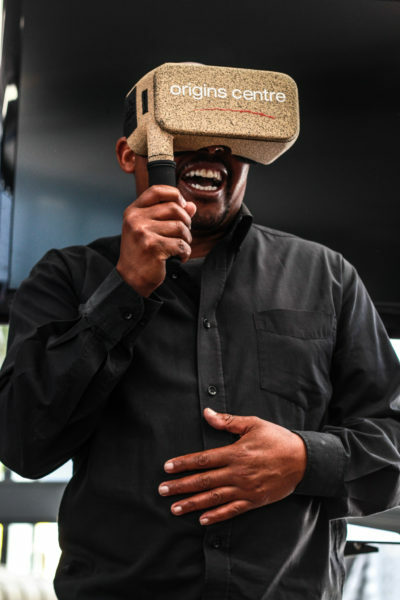 The VR experience was first launched at the Fakugesi African Digital Innovation conference on September 14 at Tshimologong, where the first person to try it out was former chief tour guide at the museum, Brian Mogaki. “VR was like a new world to me. It brings everything up close and personal, like you are inside that sphere,” said Mogaki. This technology, which comprises a headset that visitors wear, lets them see a 360-degree, multimedia view of the museum’s exhibits, allows the museum to take a piece of itself elsewhere and allow others on the outside to engage with it, he said. “It won’t replace the museum, but it is definitely an extension of it. “It is designed for your own personal experience,” said Mogaki. 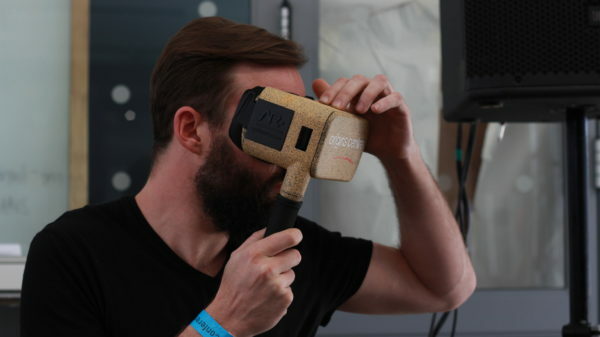 The project was developed by startup company AltReality, which specialises in VR technology. It has manufactured both the software and headsets for the Origins Centre. The headsets were 3D printed and designed to fit the look of the museum. AltReality’s art director, Gareth Steele, said that this project is about being able to tell the story in a more interactive way. “The VR experience was really designed to showcase a multimedia collection of what you see at the museum. It looks at the fossils discovered, the research being done, as well as information on DNA testing,” he said. “One of the cool things we also focused on is a 360-degree look into that multimedia world which teleports the user into history, allowing them to be part of history itself,” Steele added. Hodgskiss discussed her role of being able to “marry” the content with the technology. “My role was to provide guidance on my own areas of expertise, and to act as a link between the Origins Centre and Professor Chris Henshilwood, for whom I work at the university’s Evolutionary Studies Institute. “It was one of the institutes that provided a great deal of content for the VR exhibit,” she said. Hodgskiss and her research team’s virtual reality tour will give visitors a taste of what it was like to produce stone tools and to be inside a rock shelter. The official launch of the VR productuon will take place on Monday, 25 September at the Origins Centre Museum at Wits University.